When it comes to residential remodeling, homeowners tend to prioritize kitchens, living spaces and master suites above their homes smaller or secondary spaces. Seeing as the larger spaces are the most frequented by family, friends and houseguests; this remodeling mindset is not unwarranted. On the same hand, dream kitchens should never come at the expense of powder bathroom design. The Sea Pointe Construction team believes that spaces, both big and small, deserve the same attention to detail. Straight from our industry experts, here are a few tips and tricks for adding that wow-factor to those overlooked and under-designed small spaces. Powder bathroom designs can be tricky, we know. Larger spaces allow for multidimensional design, whereas a similar approach may feel overwhelming in a powder bathroom. While working with clients, Sea Pointe Construction design consultant Carolyn Hall shares “after guests admire your beautifully designed kitchen, blow them away with an equally excellent powder bathroom!” Rather than selecting a serious tile, Carolyn encourages homeowners to make a single daring and adventurous selection. Deco, Mediterranean or Malibu style tile statement walls, add both design interest and personality to the smallest of spaces. Even as a framing detail, an unexpected tile feature is exactly the pop of flair most powder bathrooms are lacking. Traditionally tucked away in a drab, unfrequented area of the home, laundry rooms are in serious need of design attention. Best said by Sea Pointe Construction design consultant Georgia Clarke, “No one enjoys doing laundry, but there is no reason why that workspace can’t be a beautiful one!” Luckily for homeowners, laundry room updates don’t typically make a huge impact on budget. Incorporating custom cabinetry, for specific storage needs, keeps miscellaneous laundry items off surfaces, and adds a sense of organization. A countertop, however small, makes for a great folding or sorting station. Rounding out the room with a specialty design feature, such as a sliding barn door or a phenomenal backsplash, adds extra style. Guest bathroom remodeling budgets are often compromised by a homeowner’s master bathroom focused excitement. What many clients don’t realize is that, unlike a master bathroom, most guest bathroom remodels call for minimal cabinetry, fewer tiles and less surface material. In other words, stylish guest bathroom remodels are much more manageable and attainable than they’re perceived to be! The Sea Pointe Construction design team starts with statement cabinetry for an eye catching vanity. Such a commanding design element builds character, without the need for expensive, luxury tile. In place of a shower curtain or pony wall, frameless shower doors create the illusion of space, and hugely impact the charm of small guest bathrooms. 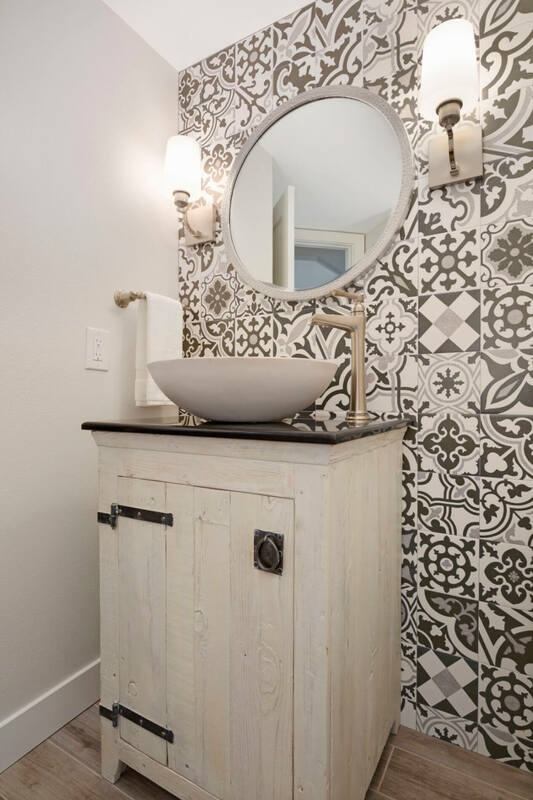 As a finishing touch, interesting plumbing fixtures further ignite the sense of professional design. All in all, small spaces can add lively design and excitement to your home. Have fun, and explore attention-grabbing design materials before glazing over a seemingly secondary space.